There are three prehistoric Cairns on Loughanleagh located in the townlands of Cornasaus, Moyer and Corraweelis. Cairns are mounds of stone, usually representing burial sites and often date back to the Bronze Age. There is strong evidence that Cairns may cover chambered burials. This archaeology site has good economic and tourist interest and its location is of national importance with these monuments being registered and protected by “Duchas”, the heritage protection body of the Department of Arts, Heritage and the Gaeltacht. The occurrence of a number of monuments on the site emphasizes the importance of Loughanleagh mountain to people through the ages. 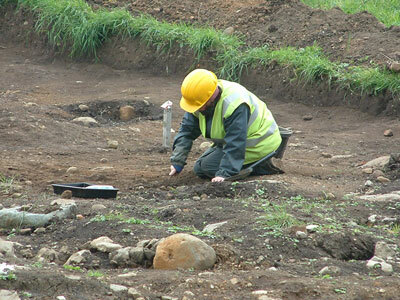 It has not yet been investigated whether there is a connection in archaeological terms, between Loughanleagh and other sites of north Meath/South Cavan. Some researchers believe that the site has strong links with other Neolithic sites located at Loughcrew, Tara and Newgrange. Situated at the highest point of the mountain range. This is a large, well-preserved circular Cairn of small and medium stones (diam. At base 17.8m). It ranges in height from 1.1m at NNE to 1.85m at S. The lower portions are partially obscured by heather. The Cairn was probably originally flat-topped (diam. of top 9.9m). Centrally positioned is a triangulation station (1119 ft.) surrounded by a small pile of stones. Recently some trial-holes have been dug into the top of the Cairn, presumably by treasure-hunters. Situated on the second highest hill in the Loughanleagh range affording panoramic views in all directions except NE. A large, well-preserved, circular cairn of medium and large stones (diam. at base 16m.). The lower portions are partially obscured by heather. It was probably originally dome-shaped in profile and presently ranges in height from 0.9m at NNE to 1.8m at SE. Recently some trial-holes have been dug into the top of the cairn, presumably by treasure-hunters. From S-SW-W the perimeter has been destroyed where modern post-and-wire fences truncate the perimeter. Bordering the site from W-N-NNE is a modern plantation of young coniferous trees. There is a large telecommunications mast 15m S.
Situated on a SE-facing slope a short distance below a prominent peak in rough, mountainous terrain. Relatively well-preserved, circular cairn (diam. At base 11m), it ranges in height from 0.4m at SE to 1.1m at NW. It is relatively flat-topped (diam. of top 7.4m). Three large holes have been dug into the top of the cairn presumably by treasure-hunters.